Cool, crisp salads, BBQ chicken wraps, signature subs, chicken salad sandwiches and so much more – available when YOU crave it! Check out our menu to see all we have to offer! Sandwiches and Subs We have all of your favorite cold sandwiches and subs. 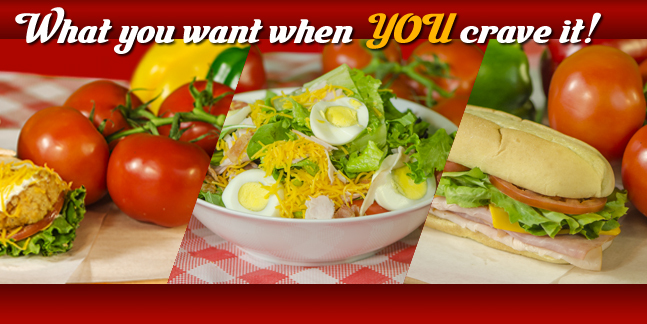 Chicken Salad, Ham and Cheese and many more delicious flavors are ready whenever your hunger strikes. Wraps Enjoy a delicious and refreshing wrap. With lots of varieties to choose from, like the BLT or the Chicken Pepper Jack, you’re sure to find something to satisfy your taste buds. Salads Eat healthy, even when you’re one the go, with our crisp, cool salads. Choose a garden salad or one of our chicken topped varieties.